When I was a kid I would occasionally spend the night at a friend’s house and play “ninja.” We would dress up in all black and sneak out of the apartment building after his parents fell asleep. We didn’t do much besides see how far we could travel by staying in the shadows and try to identify sounds that we heard in the distance. Then one day we got lost working our way through the neighborhood to try and find a friend’s house. We walked out into an intersection to get our bearings and were standing under a street light as the police car drove up. 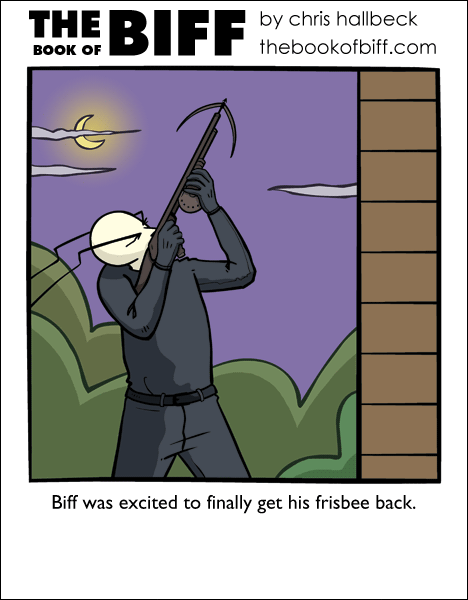 Secret agent Biff strikes again! lemme guess, the next one is “Craig”, or (just maybe) “Lazenby”, as for the grapple rifle, i want one! At least there was a police car waiting for you and your friend when you guys went into that intetsection! Ah yes, all the pieces are falling into place…. So it’s James Bond week? And that grapple gun would be awesome for the days I forget my house keys. Lazenby – the best Bond, until Craig. Most accurately captured the ‘look and feel’ of the books, but was arrogant and got in a salary war, so was sacked. All that to get a frisbee. I must have cost a lot then. @Genesismonk- u forgot the exploding message. This comic SO reminds me of Remington Steele (an 80’s TV show also starring Brosnan)!! @MaskedMan I think Rowlf was the best bond. Also, he could really play that piano. So, how does this story end? The cops came anddd……. gave you a quarter? Taught you how to juggle hamsters? Thought you were terrorists and chased you three blocks before becoming distracted by a donut shop owned by a prostitute who recently fell three stories into a vat of liquid sugar? @Pilgrymm – …and we ran! We didn’t do anything wrong but we panicked. Our reactions must have looked very suspicious to the police! Ah Chris you never fail to please. Me and my friends used to play a similar game, but we called it shadow. Weird how things like that might be everyplace. You would have like 10 people dress all in black, and then others (usually ones who didn’t bring their ninja attire) would have to find them out in the dark of the neighborhood. Heh, I wouldn’t be able to count the amount of times I could’ve used a Grapple Rifle. Can’t wait to see what ‘Craig’ does. @Chris- U were bad when u were young. On the topic of “Childhood games everyone played”, you are now aware that the floor is made of lava. Apparently I’m a suspicious person. I’ve been stopped as early as 7PM whilst going for pizza. ^^with my laughing, if you didnt understand.